Will Ultra HD kill off today's high-def? OK, so you've bought a new plasma or LCD, it's cost you an arm and a leg, and you're waiting for Channel 4's hi-def transmissions to boost your viewing pleasure. So far so good. But also be aware that there are some serious developments taking place in R&D labs around the world, all designed to make your new TV set obsolete. Those clever folk at Japan's public broadcaster NHK are leading the charge for 'Ultra HD'. This is a spectacular 4,000-line system (compared with HD's 720 or 1080 lines). A few weeks ago the first step to creating a worldwide standard for Ultra HD was taken at a meeting in Paris - much like the work that was done 15 years ago on MPEG-2. Peter Symes is director, standards and engineering, at the Society of Motion Picture Television Engineers ( SMPTE) and says a formal request from NHK to examine U-HD has been made. SMPTE has already distributed documents for pre-ballot review. Symes says: 'They [NHK] are saying Ultra HD might be 20 years away. People thought they were just as crazy when they invented HD, in analogue, first shown in the US at our SMPTE Conference in 1981, 25 years ago last year. One very well-known pundit at the time said "HD television will be delivered to the home at the same time as the anti-gravity machine." Symes says that everyone knows this is not something for the next three or four years. And whatever developments are made in image compression over the next 10 to 15 years, it is also inevitable that Ultra-HD will need significant amounts of bandwidth per channel - great news for satellite. The other good news to emerge from SMPTE is that HDTV - as we know it today - is far from done and dusted. 'What we are also exploring at SMPTE how the two now-established transmission standards, 1080i and 720p, might move forward. For example, many engineers looked at 1080p (in 50Hz or 60Hz) as something of a 'super production' standard, which would easily convert to 1080i or 720p and be a good archiving format. Thoughts are now changing, asking whether it makes sense to move the standard from a production format to potentially much wider distribution. The EBU has done some excellent work in this area, which suggests 1080p could well be a transmission format as we move forward,' says Symes. He suggests that while 1080p would be the natural next step for HD, far more work will need to be done over the next few years on cameras and displays if Ultra-HD is to happen. The Japanese view is that it's impractical to think of a 'wall of glass' for Ultra-HD. 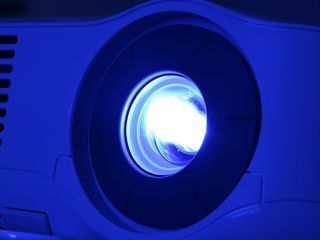 Much better to have a sophisticated projector, not unlike the type used in IMAX cinemas. However, a typical IMAX projector weighs some 1.8 tonnes, so some advanced miniaturisation engineering is needed. IMAX has the added challenge of lens changing; an IMAX projectionist has to wear robust special clothing to change its 15,000W high-output xenon-arc lamps, such is the risk of explosion! NHK's Kohji Mitani, a senior engineer at NHK Japan's Science & Technical Research Labs, says Ultra HDTV would deliver 33million pixels to screens - not yet developed - of 100in-200in size. Many experimental transmissions had been made, including NHK's important New Year's Eve live four-hour transmission of the annual concert from NHK Hall in Tokyo to NHK's Osaka studios, some 500km apart and at 640Mb/s transmission rate. This used optical fibre, but Japan's long-term plan is to use the 21-22GHz satellite band. Mitani suggests that this initial R&D stage would lead to phase two starting around 2009, and is likely to take four to five years to include actual satellite transmissions. But there are also physical concerns: anyone old enough to remember the 'Cinerama' technology in cinemas, where three overlapping projectors delivered massive screens that wrapped around the audience in a 146 degree arc, will also remember that some viewers were physically sick when they showcased an American rollercoaster ride. Evidently, there can be similar responses to Ultra-HD. NHK's 'practical' phase three is likely to start around 2012 - with considerable interest in the London Olympics - and more aggressive transmission trials perhaps lasting another 10 years while at the same time allowing camera, lens, and especially display technologies to catch up. Incidentally, Japan is scheduled to start its first regular 3D transmissions (by satellite, naturally), on the night of December 1. Nippon Broadcasting will use its BS 11 channel (for Broadcast Satellite) for a 15-minute nightly demo of 3D material. This article first appeared in What Satellite & Digital TVmagazine (issue 257).